Central Australia, also known as the Alice Springs Region, is one of the five regions in the Northern Territory. 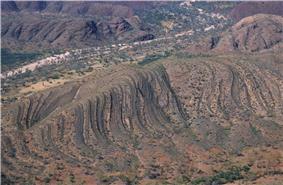 The term Central Australia is used to describe an area centred on Alice Springs. It is sometimes referred to as Centralia; likewise the people of the area are sometimes called Centralians. The region is located in the southern part of the Northern Territory spanning from the west on the Western Australian Border to the east on the Queensland border. Northern Territory was too large to be adequately governed, and thus for a short time separate territories named North Australia and Central Australia existed. Central Australia, like North Australia, had its own Government Resident and administration, based at The Residency, Alice Springs. The division was along the line of 20 degrees south, down to the South Australian border, and took effect on 1 February 1927 through the North Australia Act 1926. 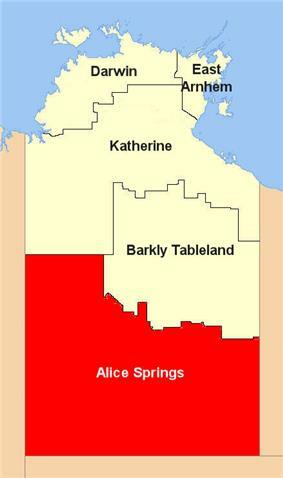 However the arrangement lasted for less than five years, and the separate territories were reincorporated into the Northern Territory on 12 June 1931. The main town in Central Australia is Alice Springs; however, this area also includes all of the desert lands surrounding it. Whilst a few of these townships (such as Barrow Creek) are stations (ranches), the vast majority of them are indigenous Australian communities. The region covers an area of 546,046 km², which makes up forty percent of the Northern Territory. There is no official centre of Australia. The concept has intrigued various people from the time of early European exploration. Central Mount Stuart, for example, was so named because it was believed to stand at the geographical centre of Australia. Today, different calculations give varying results but in general they agree on the area within 200 kilometres south of Alice Springs. The total population of Central Australia is estimated to be 50,000-60,000. Alice Springs, the main urban area of Central Australia, is predominantly Anglo-Celtic Australian, with approximately 25% Aboriginal population; however, the surrounding communities which make up Central Australia are almost exclusively Aboriginal. Altogether, the population of the region is about 40-45% Aboriginal. The region is very dry, receiving on average just 150 mm of rainfall annually. ^ Laity, Julie J. (2009). Deserts and Desert Environments. John Wiley & Sons. pp. 43, 45. "Centre of Australia, States and Territories". Education/Fab Facts. Geoscience Australia. 2004. Archived from the original on 2006-01-08. Retrieved 2006-02-13.